Waterfalls are rare in the Southwest except for seasonal examples that appear after snowmelt or briefly after a heavy rain. For that reason we treasure the few that put on their show year-round, including Lower Calf Creek Falls in Grand Staircase-Escalante National Monument, Utah. 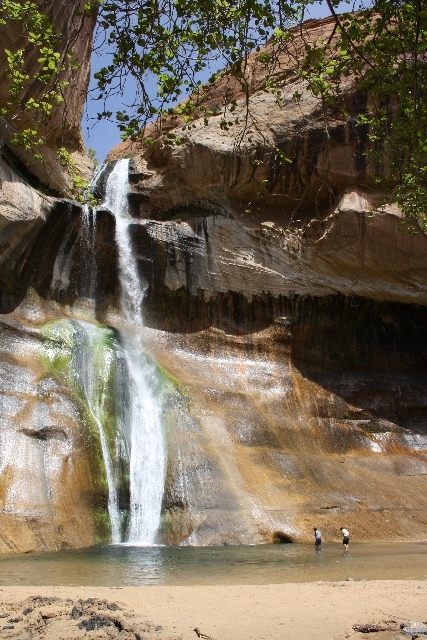 The Lower Calf Creek Falls Trail is one of the most popular in the park, and for good reason. Besides standing beneath the 126-foot waterfall and taking a dip in the natural pool below it, you will travel through a Navajo sandstone canyon that flanks Calf Creek intermittently, and be able to see two prehistoric granaries and a spectacular pictograph panel. Elevation gain is slight on this well-worn trail, making it a good choice for families, assuming children are up to walking six miles round trip. The trail head is in the back of the Calf Creek Campground at an elevation of about 5,400 feet. Expect afternoon temperatures in June in the 80s or 90s, which make for a warm hike, so head out in the morning. On your return there are a few places you can access Calf Creek itself for some needed relief from the heat by soaking your feet. Don’t plan on drinking this water, you will need to bring along all you will need . Be sure to pick up the interpretive brochure from the campground hosts or at the trail head. This will give you information on some of the highlights you will find on the trail including where to look for the evidence of prehistoric and historic use. You wouldn’t want to miss seeing the ruins of two American Indian granaries, thought to have been built hundreds of years ago. There are also three red pictographs on the canyon walls that appear to be depicting warriors. If you bring along binoculars they will come in handy to get a better look at these sites. As you follow the trail up Calf Creek, in the last segment approaching the falls the vegetation becomes denser with mature deciduous trees, and you will feel the temperature drop. Look along the creek for small ponds where beavers have built dams. You will get a quick glimpse of the falls above the tree line and then after traveling through the worn path under the canopy of trees you will be at the sandy edge of the large natural pool created by the waterfall. You will find maidenhair , scarlet monkey flowers and alcove columbines growing in the cliff walls surrounding the waterfall. Wade into the large pool below the falls and lie back for a refreshing all-over soak. Or simply sit on the sandy bank and let the mist from the fall settle onto your skin like the cooling dew of a mountain morning. Calf Creek Campground has 14 campsites and is managed by the Bureau of Land Management. Call 877-44-6777, or visit www.recreation.gov for more information. Many of Deborah Wall’s columns were recently compiled with new information and photos in “Base Camp Las Vegas” and published by Stephens Press. She is the author of “Great Hikes, a Cerca Country Guide.” Wall can be reached at Deborabus@aol.com.